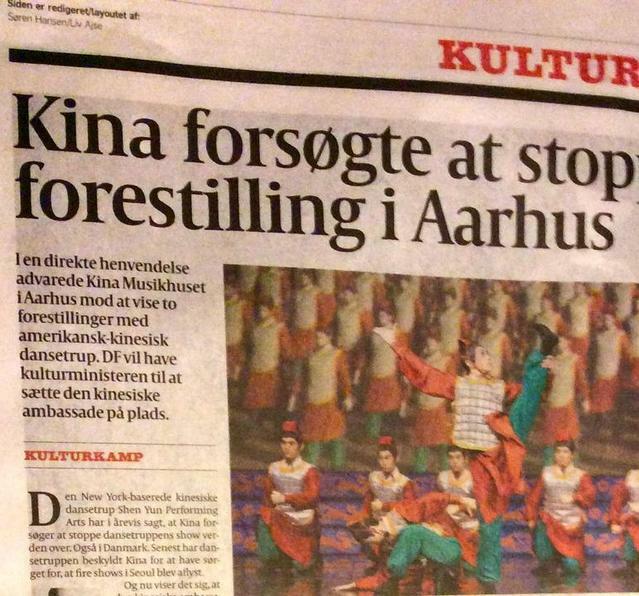 Politiken, a leading Danish daily newspaper, carried a report titled, “China tried to stop performance in Aarhus” (Kina forsøgte at stoppe forestilling i Aarhus) on May 26, 2016. The report exposed a letter sent by the Chinese embassy to the concert hall in an attempt to block the scheduled performance of Shen Yun Performing Arts in Aarhus, Denmark. The embassy “crossed the line,” said Alex Arendtsen, spokesman for the culture department of the Danish People's Party. 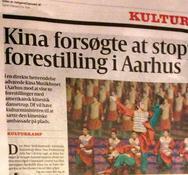 Christensen said to the reporter of Politiken that the two shows in the concert hall were almost sold out. Nearly 3,000 people had bought tickets. 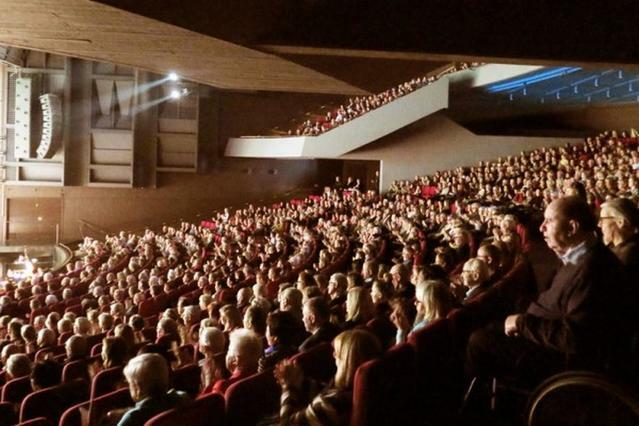 Shen Yun performed two shows in Aarhus on April 12 and 13, 2016. Television producer husband-wife duo Ms. Thera Hoeymans, a journalist and TV host, and Mr. Jorgen Vang, a videographer and film producer, said that China has 5,000 years of civilization, and that they saw it brought to life in Shen Yun Performing Arts. The couple said they saw absolute beauty at the performance at Aarhus on April 12. “The very lightness, and the elegance and the music and the body expression, made me feel like everything was very… It seems like everything was so light and joyful, and very emotional, very spiritual, and you got the feeling that you were lifted up by the universe,” Ms. Hoeymans said. She said that she felt this from the depth and beauty she saw in each and every performance. “I feel a peace. I do. I’ve had a lovely experience, and I feel lifted of something, yes,” she said. Mayor Uffe Jensen from Odder, a smaller city about 12 miles from Aarhus, watched the show on April 12. He said he had never seen a performance like this one. He found the orchestra, blending traditional Western and Eastern instruments, amazing, even superb, and was excited to see dances telling of traditional Chinese stories and legends. That Denmark welcomed the dance company is not in doubt. The two performances were sold out, and the audience was very warm, giving standing ovations and three curtain calls.